Looking for some office inspiration? Take it from these 4 companies. Many of this year's winners effortlessly blend elements, old and new. Plants become conversation pieces, bland staircases are a thing of the past. Let's take a look at these office design marvels. Airbnb's new Dublin headquarters, built inside an abandoned warehouse, is the first office the company has designed from scratch. The huge staircase at the center serves as a working and meeting area. The office is organized into 29 "neighborhoods," or distinct space configurations, to give staff plenty of options for places to work. The giant staircase offers a view of a huge TV screen that's used during presentations. Meeting rooms draw inspiration from Portugal, Greece, and other places around the globe. Another twist? These rooms are modeled after actual Airbnb rentals! Design firm Linehouse transformed a former opium factory into the Chinese flagship office for co-working company, WeWork. The space combines old and new with the original staircase, steel beams still intact. Customers can pull up a stool and chat over coffee or tea in the kitchen. Fluorescent lights create, what the design firm calls, a "tropical retro" feel. Booths and open work areas overlook the building's sunny atrium. Hand-painted, poppy patterned wallpaper plays up the office's opium factory roots. The ride-hailing company wanted its Pittsburgh office to reflect its disruptive ambitions. This particular Uber Center is home to the Advantage Technology Group center. They installed the "Tunnel of the Future," featuring renderings of different prototypes. Assembly Design drew inspiration from the City of Steel when creating a vision for the space. Walkways are designed to look like Pittsburgh bridges, while the wall in the open area is made of cor-ten steel, laser-cut to depict a map of Pittsburgh. The showroom is where Uber engineers research and develop mapping and self-driving car technology. Garage doors slide open so that cars can go directly into the all-hands meeting areas for employees to view. Built into a Victorian castle, Money.co.uk combines old-fashioned, medieval elements with modern decor and splashes of color. Design firm, Interaction, gave the space new life but kept its traditional architecture. Each room has a Sonos speaker system controlled by a wall-mounted iPad. Outside each meeting space is a touchscreen booking panel that's linked to each employee's personal calendar. The fintech company's many Star Wars fans helped influence the theme of the cinema. When it's not being used for meetings, the room serves as a space for employees to screen movies, play video games, and snack from a popcorn machine. 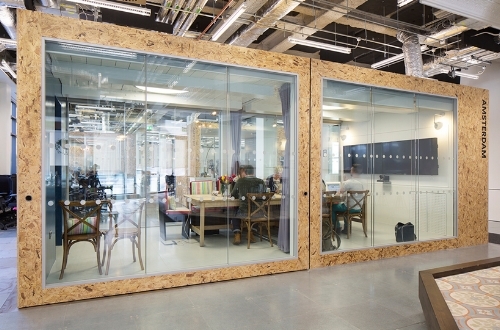 What do you think of these funky offices? Too much? Or an awesome work experience? Let us know in the comments!